I don't think I could make myself wear anything that expensive as the original. But what a great price for the steal. Wow, what a great find on this one. Awesome Sunday steal this week! The Wild Diva Steal is an exact match and for a fraction of the cost! Sign me up! These are lovely. And I love that price on the Sunday steal. The price is lovely, but I really do not like the shoes. They remind me of armadillos. I hope you're enjoying your Sunday. The Wild Diva one is definitely a great price! I like the Wild Diva's for so many reasons! $26.20? Um, sign me up please! I just don't know what outfit I would pair it with just yet. Hope you had a great weekend! What beautiful wedges! I can't wait for summer so I can wear them. Not my thing, but a great alternative pricewise! The cheaper one is such a good match! The shoes aren't really my style, though. 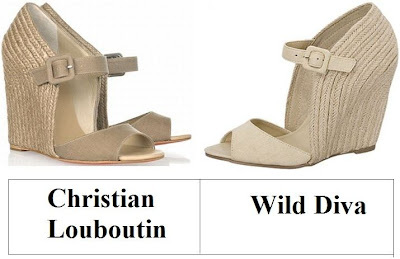 Not my style, but I'd definitely go for the Wild Divas over the Louboutins at that price! I can't even come close to affording the Louboutin's but at the same time I have a hard time being okay with blatant knockoffs. The Wild Diva's are cute but at $26.20 are they comfortable or durable? My shoes are usually around the $70 mark unless I'm really splurging on something special (and then it tops out at probably $250) but sometimes even that quality is still unfortunately lacking! wild divas for sure! Just too similar to ignore! Great find, Erika! These are such a close match! what a great match! i love the metallics on the louboutins, but love the price of the wild divas! Love. These Shoes! I have to find them (the affordable pair). Happy Monday Erika!